I may be sole author of this thesis, but this has been a truly collaborative research project, one that has been made possible thanks to the generosity, time and expertise of a great many people during the last 3.5 years that I have spent writing this thesis. Which is why I’d like to take this opportunity to formally acknowledge their support and to apologise in advance to anyone whose contribution I have inadvertently overlooked. I would like to thank my Chief Supervisor, Dr Simone Murray (Monash University), and my Associate Supervisor, Dr Andy Ruddock (Monash University), for helping me breathe life into this project and bring it to completion. Their contributions are almost impossible to enumerate here, but I hope my finished thesis does justice to their invaluable advice, support and encouragement. Thanks must also go to the following academic staff from Monash University: Associate Professor Shane Homan, who was my Acting Associate Supervisor throughout 2012; Dr Belinda Smaill and Dr Rebecca-Anne Do Rozario, who (respectively) acted as the independent members of my Confirmation of Candidature and Mid-Candidature Review panels; Associate Professor Mark Gibson and Dr Anna Poletti, who (respectively) served as the Chair and independent member of my Pe-submission Seminar; and Associate Professor Brett Hutchins for his ongoing insights about the thesis-writing process and academic life generally. Dr Kate Creegan (Co-ordinator, Graduate Researchers in Print [GRiP], Monash University), together with my fellow GRiP Thesis Writing Workshop participants (2012-13), also deserve special mention for help me to improve my writing and clarify my arguments in the earliest drafts of my thesis. Special thanks must go to Dr Toni Johnson-Woods (University of Queensland), who set me on the path that eventually led me back to postgraduate study after spending many years in the journalistic wilderness. I would like to thank Klara Arnberg (University of Stockholm), Tomas Nilson (University of Gothenburg) and Helle Straandgard Jensen (University of Copenhagen) for sharing with me their insights about comic-book censorship in post-war Sweden, and for providing me with copies of invaluable historical documents about the Scandinavian anti-comics debates of the 1950s. I owe an incalculable debt of gratitude to the following Phantom “phans” and comics historicans, without whose help this thesis would all the poorer: John Clements (Australian comics historian); Andreas Eriksson (Scandinavian Chapter of the Lee Falk Memorial Bengali Explorers Club, Sweden); Danny Ahrling (Egmont Karnan/Inkdragon Studio, Sweden); Bryan Shedden (Creator of The Deep Woods website); and Carl Braga (Human Media, Australia). Further thanks must go to the following people who made my 2012 research trip to Sweden such an enjoyable and rewarding experience: Brian Jensen (Co-founder, Scandinavian Chapter of the Lee Falk Memorial Bengali Explorers Club, Sweden); and Ronny Stenback and Anders Silling (Organisers, Carlstad Comic Con, Karlstad, Sweden). Thanks must also go to all the members of the Scandinavian Chapter of the Lee Falk Memorial Bengali Explorers Club who attended (and hopefully enjoyed) my presentation about this research project at the Carlstad Comic Con, and for making me feel most welcome in Karlstad. 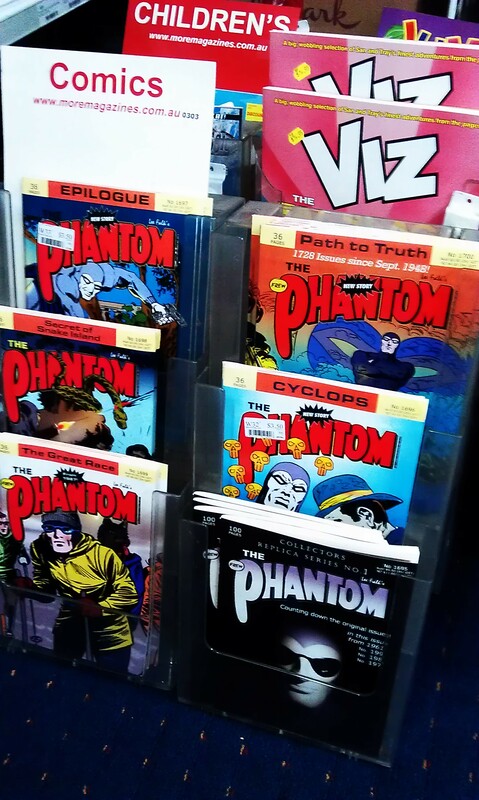 I must, of course, thank the nearly 600 Phantom “phans” from Australia, India, Sweden and elsewhere who took the time and effort to complete The Phantom Comic-Book Survey online. Your passion and enthusiasm for “The Ghost Who Walks” is truly infectious, and your thoughtful and articulate responses enlivened what could have otherwise been a dry and dusty questionnaire. Thank you for sharing your memories and impressions of The Phantom with me, and with the wider academic research community. Speaking of “phans”, I would like to take this opportunity to thank the following people for their help in publicising my research project amongst the international Phantom “phan” community, as well as sharing with me (or obtaining on my behalf) rare Phantom publications and artefacts from their collections: Joe Douglas (Creator, ChronicleChamber.com, Australia); Richard Fry (Lee Falk Memorial Bengali Explorers Club, Australia); Arne Olin (Lilla Torgs Seriemagasin, Malmö, Sweden); Jermayn Parker (Phantom Phorum, Australia); Dennis Ray (3-D Comics, Arlington, Texas); the late Ed Rhoades (1946-2012) (Friends of the Phantom, USA); and Alok Sharma (Director, Chitrakatha documentary, India). I would like to thank the following people associated with The Phantom comics franchise in Australia, India and Sweden, who allowed me to interview them for this project, and who generously shared with me their time and insights – my work is all the richer for their contributions: Peter Gräanby (Marketing Manager/Syndication, Bulls Press, Sweden); Ulf Granberg (Former editor, Fantomen, Sweden); Magnus Knutsson (Former writer, Fantomen, Sweden); Janne Lundström (Former writer, Fantomen, Sweden); Hans Lindahl (Illustrator/Co-editor, “Fantomen” comic-book serial, Sweden); Gulshan Rai (Managing Director, Diamond Comics, India); Claes Reimerthi (Writer/Co-editor, “Fantomen” comic-book serial, Sweden); the late Jim Shepherd (1933-2013) (Managing Director, Frew Publications, Australia); Mickael Sol (Editor, Fantomen/Egmont Karnan, Sweden); and Germund von Weren (Former editor, Fantomen Kronika). Garry Shead graciously granted me permission (via the National Film & Sound Archive, Canberra) to obtain a copy of his 1973 experimental film, Fanta, for study and review in this thesis. Thanks must also go to my friends Annette Welkamp (Cultural Connotations, Melbourne) and Dale Roberts for their thoughtful and timely contributions to my thesis. I would like to acknowledge the following individuals and organisations for providing me with invaluable research assistance throughout this project: Cathie Gillam and Alex Gionfriddo (Co-librarians), AFI Research Collection, RMIT University (Melbourne); Mark Johnson (Archivist, King Features Syndicate, New York); Ingrid Berg (Kungliga Biblioteket, Stockholm); Motion Picture Distributors Association of Australia (Sydney); Richard Overell (Rare Books Librarian), Rare Book Collection, Monash University (Melbourne); National Archives of Australia (Canberra); National Film & Sound Archive (Canberra); and the National Library of Australia (Canberra). I wish to acknowledge financial support received from the following institutions and assistance programmes during the course of my PhD candidature: Australian Postgraduate Award (Department of Industry, Australian Government); Postgraduate Research Travel Grant Scheme (Monash University); Faculty of Arts Travel Grant Top-Up Scheme (Monash University); Postgraduate Research Support Fund (School of English, Communications & Performance Studies, Faculty of Arts, Monash University); Research Unit in Media Studies (RUMS) Research Funding Support (Monash University); and the Centre for the Book Research Unit Fund (School of English, Communications & Performance Studies, Faculty of Arts, Monash University). I would like to thank my mother Gwen, my brother Michael and my sisters Claire and Brenda for their unstinting support and unflagging interest in my work. Now, at last, they can see just what exactly I’ve been upto for the last three-and-a-half years! My wife Sophie deserves my greatest thanks of all. Her support for me has never wavered, and her faith in my ability to complete this thesis has never faltered, even though there were many moments when I doubted myself. I may be the sole author of this thesis, but none of what I have written would have been possible without her.